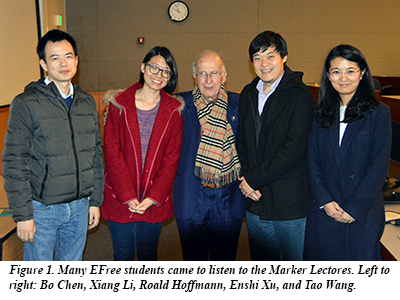 EFree Partner Roald Hoffmann gave two invited lectures at Penn State University as a part of their Marker Lecture Series, from November 30-December 1. The Marker Lecture Series is named in honor of Penn State's Professor Emeritus Russell Marker, who was one of Penn State’s most accomplished former faculty members. He came to Penn State in 1935 after a brief period with the Ethyl Corporation, where he coined the term “octane number.” At Penn State he devoted himself to steroid chemistry, and between 1935 and 1938, published over 50 papers on the subject including a number on a new synthetic technique that is still known as the Marker Degradation.